"Imperious Black Angers was formed in 2007 by Olivier Mure with the plan to set up a serious organisation and a team in the West of France. This year, we have decided to acquire a Millennium Series Division 1 License. It is a good opportunity for the Imperious Black Angers players to evolve in another division and to give the best of themselves. We'd like to thank our sponsors; paintball-xtrm, MAXS Sport and xtrmtour.fr. We would strongly advise that all teams and supporters planning to attend our UK Event secure accommodation for this as far in advance as possible, due to the upcoming 2012 London Olympics. 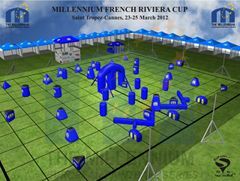 You can find a full list of accommodation here www.millennium-series.com/events.php?event=T3 including partner hotels and on site camping. Please ensure you use the booking codes to receive the discounted pricing. 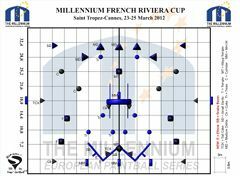 The EPBF has 2 rule modifications for the 2012 season, which the Millennium Series has accepted and will implement for their 2012 Events. A further 2 rule modifications will be implemented for the 2013 season. No communication is allowed by anyone from the designated staging area to the active field of play during any team points or matches. This means no pit side coaching will be allowed anymore. Teams, managers, pit crew or any other person will not be allowed to coach from the pit area. Teams violating this rule will be penalised in accordance with existing rules. For 2012 any players false starting by removing the barrel of the gun from the start gate before the start signal is given, will NOT be automatically pulled from the point, as long as they immediately return it to the gate (touch back). Even if the signal goes before they have retuned it, they may still return the barrel to the gate (touch back) and then can continue. If they fail to return the barrel to the gate (touch back) either before or after the start signal is given, they will be eliminated. If, however, a player posts their marker or fires it before the start signal regardless as to whether they later touch back, they will be eliminated in the normal manner. The colour yellow is prohibited on any players equipment or clothing, except that a player's jersey, pants, gloves or shoes may have yellow, so long as no part of the yellow colouring is more than 0.25 cm from some other colour, and no more than 10% of any 5cm by 5cm square on clothing or item is yellow. For reference purposes, 'yellow' is any colour similar to Pantone colours 101, 102, 107, 108, 109, 116, 3945, 3955, 3965, and 803, although any head judge may prohibit any equipment they believe interferes with the judges' ability to officiate effectively. Paintballs may NOT contain PINK, RED, or ORANGE fill. In future The EPBF will be setting organised time lines for the consideration of any rule changes by the rules committee via National Federations, and will in any case, announce by November 2012 for the 2013 and 2014 season . Announcements on the procedure will be placed on the EBPF website in due course. Following a very successful previous year in Semi Pro League, top Polish team Ranger Warsaw will join the Millennium Series Champions Paintball League in 2012! As a result of the team's fourth place in the SPL division last year, the team has been offered an opportunity to acquire a licence for the highest division, now competing with the best teams from Europe and North America. Since its formation in 1996, the team has won multiple Championship of Poland titles and played successfully in the international arena. Since 2008 Ranger Warsaw has honed their skills in the Millennium Series and has regularly continued to improve their standing since then. Dublin Wildfire Join Division One! "Dublin Wildfire was formed in 2007 from new paintballers in Ireland. Since then the team has grown in size and experience by playing Irish and international tournaments. We plan to move up through the ranks of the Millennium Series thanks to our main sponsor and home field Capital Paintball, dublinpaintball.ie"
"The Razorback Saint Etienne paintball team was born 12 years ago near Saint Etienne, France. The members of this team are friends before everything else and have played together from the beginning. We have played in a lot of French tournaments and competed in other countries also. We decided last year to jump into the Millenium Series, where under the name of Le Chambon Sur Lignon DAP, we acheived a top 8 ranking in the first round of Division 2. As a result, this year we have acquired a Division 1 licence in order to compete with top teams as Razorback Saint Etienne."